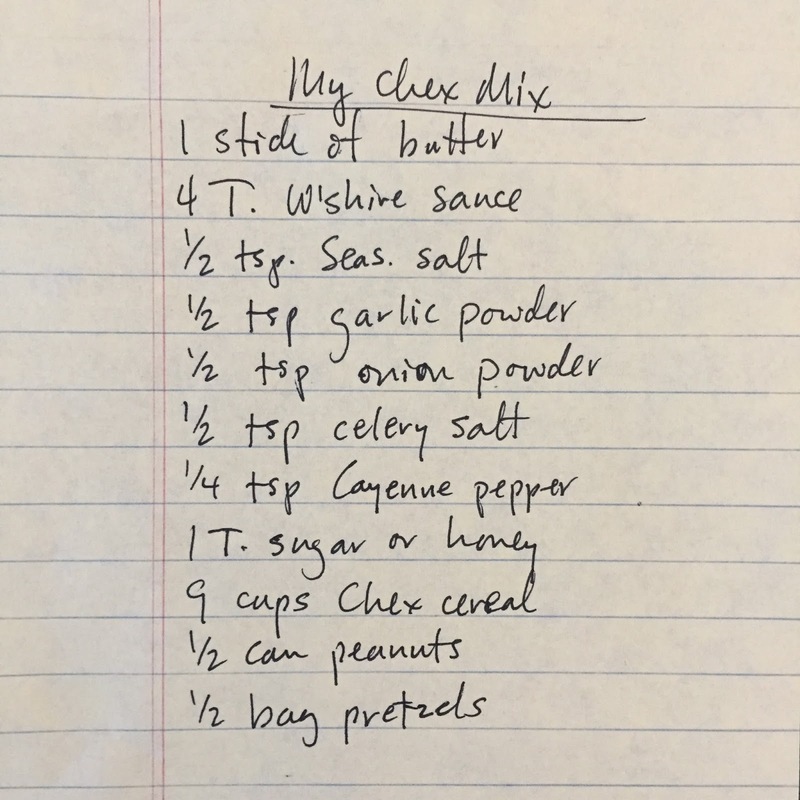 Is there an American anywhere not familiar with Chex “Party Mix?” It is arguably the highest and best use of Chex cereal. And for me, Chex Mix is the ultimate comfort snack. I grew up eating the stuff. My mom made it not only for parties and family get-togethers, but sometimes just for fun because we loved it. I learned early on that she did not follow the recipe exactly, and adjusted the ingredients to her liking–extra Worcestershire sauce, trading out some of the seasoned salt for celery salt, no Wheat Chex, etc. When I started making it for my family, I had already altered the traditional recipe considerably, and it’s continued to evolve over the years. Can you really improve on a classic? I’ll bet most of us who make Chex Mix change it up to suit our own preferences, and for me, that starts with the Wheat Chex. I would rather eat Wheat Chex straight out of the box than in my party mix. Some might argue Wheat Chex taste like the box, but I wouldn’t go that far. They just don’t belong in my mix. Leave them out and increase the Corn and Rice Chex, to 9 cups total. Mixed nuts? Does anyone really eat all the nuts in that weird assortment? I never have, and therefore they do not make the cut for my party mix. Nix the mixed nuts, and go for PEANUTS ONLY. And not a cup, like the original recipe. Just put in half the can. That might be about a cup anyway, and it’s about the right amount of peanuts only! Then we come to pretzels. Everybody loves pretzels. A sorry one cup of pretzels I will not abide. Half a bag does the trick for me. And that’s it for the components of Chex Party Mix. No bagel chips, Cheez-It crackers, Cheerios or other add-ins. Just Rice & Corn Chex, peanuts, and pretzels. The seasonings of course need tweaking. The original recipe in my file calls for six tablespoons of butter. Six tablespoons. It’s much easier and more streamlined to use one stick of butter. That’s eight tablespoons. Big deal. These seasonings reflect my personal taste preferences and go above and beyond the original (ho hum) seasoned salt, garlic powder, and onion powder. If you would like hold fast to the original, it’s printed on every box of Chex cereal on the grocery store shelf. It’s also here. In a large baking pan (I use a roasting pan), melt the butter and stir in the w’shire sauce and all remaining seasonings. 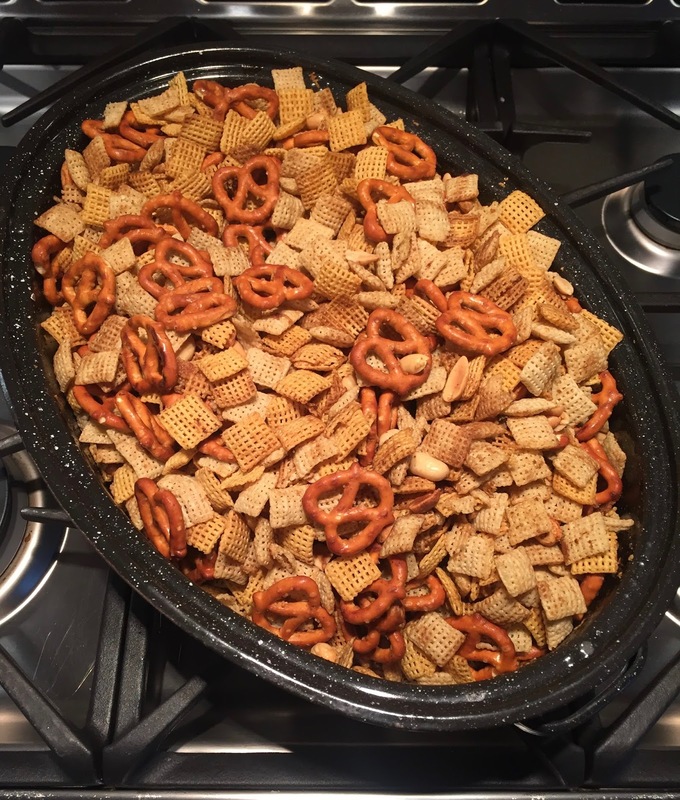 Stir the Chex cereal, peanuts, and pretzels into the seasoning mixture to coat everything. Put in a 250 degree oven, for one hour. Every 15 minutes, give the mix a stir. Otherwise it will brown on the bottom. You don’t want a lot of browning, but rather a nice even toasting of everything. When done, let it cool and enjoy. If you can wait that long. No matter how you make your Chex Party Mix, I’m sure we can all agree that once you starting eating it, it’s hard to stop.